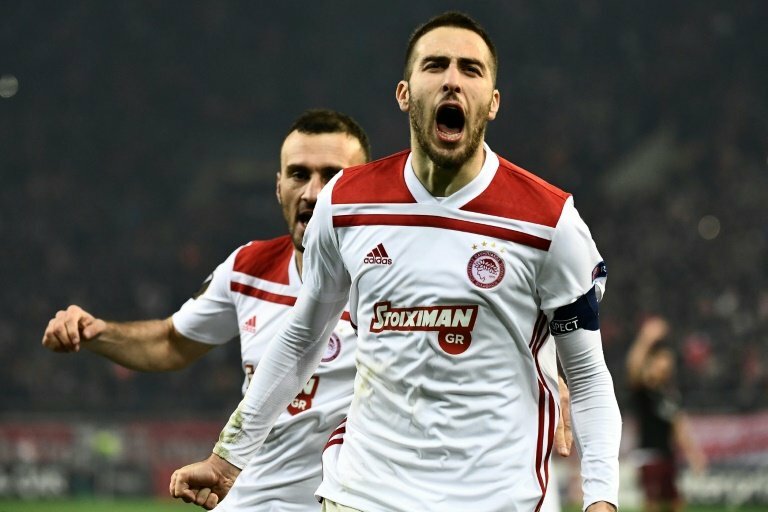 Olympiakos dumped AC Milan out of the Europa League on Thursday after beating the seven-time European champions 3-1 in a pulsating clash in Greece, while Eintracht Frankfurt fans ran riot during the German side's win at Lazio and Celtic made the knockout stages despite losing to Salzburg at Parkhead. Captain Kostas Fortounis' penalty nine minutes from time saw the Greeks move into second place in Group F ahead of Gennaro Gattuso's Milan, who thought they had squeaked through when Cristian Zapata had pulled a goal back less than two minutes after putting the hosts 2-0 up with a comical own goal. Olympiakos finished level on 10 points with Milan but qualified ahead of the Italians thanks to their superior goal difference following Milan's 3-1 win over the Greeks in October, and they end the group stage two points behind group winners Real Betis, who drew 0-0 at Dudelange. "It's a bitter night... We shouldn't have conceded the first goal and it all went south from then on. We should have done better in the group and come to Greece already qualified," said Milan captain Ignazio Abate, who gave away the decisive spot-kick by fouling former Roma player Vasilis Torosidis. 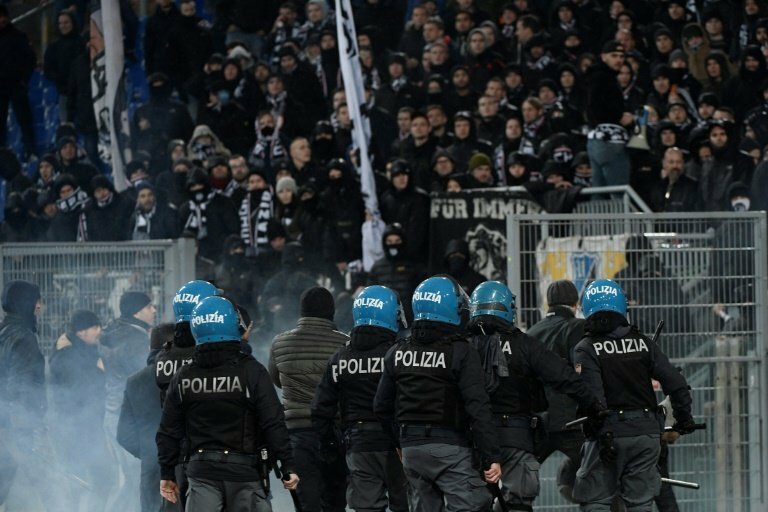 Five Eintracht Frankfurt fans had been arrested in clashes with police in Rome ahead of their dead-rubber Group H match against Lazio as nearly 9,000 Germans swamped the Stadio Olimpico. Eintracht had already comfortably taken top spot in the group thanks to winning all five of their previous games, while Lazio were also in the last 32 regardless of the result of the match, won 2-1 by the away side as they came back from a goal down thanks to second-half strikes from Mijat Gacinovic and Sebastien Haller. However, away fans charged the pitch after Joaquin Correa's 56th-minute opener, and subsequently threw smoke bombs and flares at both Lazio fans and the police. Last year's runners-up Marseille finished bottom of that group after losing 3-1 at home to Apollon Limassol and ending the group stage with just a single point. 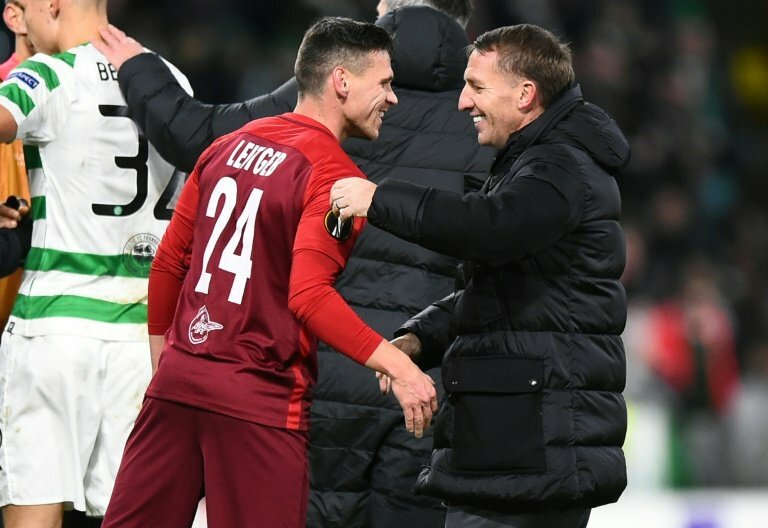 Celtic looked to be following Old Firm rivals Rangers out of the competition after Steven Gerrard's side fell 1-0 at Rapid Vienna earlier on Thursday, but Tore Reginiussen's equaliser four minutes from time for Rosenborg at RB Leipzig allowed Brendan Rodgers' side to qualify second from Group B, two points ahead of the Bundesliga outfit. Second-half goals from Munas Dabbur and Fredrik Gulbrandsen meant that Salzburg topped the group with a 100 percent record after a 2-1 win, while Olivier Ntcham's stoppage-time penalty meant nothing for the result nor the final standings. "There will be things from a performance perspective that we can go away and look at," said Rodgers. "But the campaign ended tonight in terms of the qualification and we're through which is an absolutely huge effort from everyone." Earlier Rangers, who had to win at Rapid Vienna in their final group game in order to qualify for the last 32, finished third in Group G after losing 1-0 to group winners Rapid, Dejan Ljubicic sealing the points in the 84th minute. The Austrians are through to the knockout stages, level on 10 points with group winners Villarreal. Chelsea, who had already won Group L, looked to be on their way to a perfect sixth win from six, but could only scrape a point at eliminated Vidi thanks to substitute Olivier Giroud's late free-kick, after an Ethan Ampadu own goal and Loic Nego's sumptuous volley had put the hosts a goal ahead. Alexandre Lacazette confirmed Arsenal's dominance of Group E with the only goal of a low-key 1-0 win over bottom side Qarabag. Malmo are in the knockout stages after snatching a 1-0 win at Besiktas that saw the Swedes leapfrog their Turkish hosts in the extremely tight Group I. All four teams in the group were in contention for qualification on Thursday, but Genk managed to hold on to first place after hammering Sarpsborg 4-0.